On 30th October 2017, Perbanas Institute received an award from the Government of Jakarta at the 89th Youth Pledge Day held at the Monas complex in Jakarta. Perbanas Institute was awarded for attaining the second most gold medals for Jakarta at the 2017 National Youth Sports Week in Makassar. This bi-annual sporting event gathers young athletes to represent their respective provinces in a variety of disciplines from football to badminton; athletes from Perbanas Institute accumulated 14 gold medals. 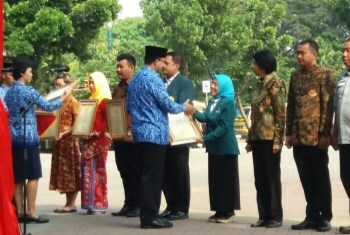 Present at the ceremony to receive the award on behalf of the institute was Dr Wiwiek Prihandini as Vice Rector of Academics and Finance. Through its achievements at National Youth Sports Week, Perbanas Institute demonstrated its capacity to provide students with the necessary soft skills coupled with numerous extracurricular activities such as sports, culture, and arts. Further supporting student-athletes in this regard is the institute’s e-learning platform which offers flexibility in education delivery and thus accommodates the rigorous training schedules. Moreover, the state-of-the-art in-house training facilities set the foundation of a winning culture and are paramount to the success of its sports teams. This approach has garnered Perbanas Institute’s reputation for producing prominent national athletes competing on the local and international stage.